I don't have anything special planned, but I wanted to acknowledge that it was four years ago today that I started this blog! 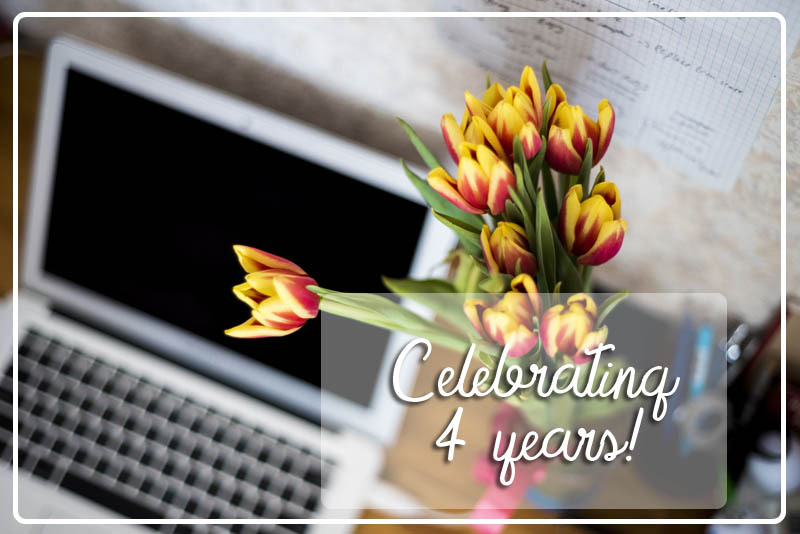 This is cliche I know, but when I started, I would never have thought I'd make it to four years. I am so used to picking up hobbies and gradually letting them fall away. :) I have seen more recently how much harder it is to keep blogging - to find the time, or find the inspiration for new and interesting posts. But I still find it very rewarding, and I feel accomplished whenever I schedule a new post. I hope I can keep blogging for a long time. I didn't expect either to have gotten to know so many wonderful bloggers internationally because of this. It's always been a fantastic perk - just checking in with bloggers through all the social media makes me happy, and I thank every one who visits the blog and keeps in touch. I'm so grateful for everyone. It's wonderful to be a part of the blogging community! In Movie Musical Challenge, I'm watching 20 films I picked as great films or films I wanted to watch. 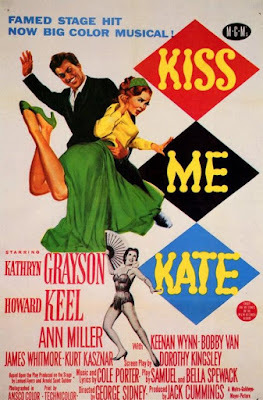 This post is about the 1953 film Kiss Me Kate starring Kathryn Grayson, Howard Keel and Ann Miller. The music is Cole Porter, and I love me some Cole Porter. "Why Can't You Behave," "I Hate Men," and my very favorite "So In Love" were highlights in this film, with the staging and dancing of "Why Can't You Behave" being the visual highlight. Ann Miller is such a vivacious dancer. Even the gangsters who annoyed me a bit when I saw the show live, came off as more silly and fun in this film. The approach to the story with this movie was much more entertaining for me, I guess. This film also re-teamed Grayson and Keel after their roles in Showboat from a couple years earlier, and I love them as a team. I think Kathryn Grayson distinguishes herself much more in this though - she was perfect as the young, innocent ingenue in Showboat, but she was also fantastic as the cynical, shrewish Lilli/Kate in this. I was wondering how I would feel about her singing too, because it's such a pure soprano, that I found it hard to imagine it imbued with the hate or anger that Kate sings with. But she did it! It's interesting to note that Bob Fosse is one of Bianca's beaus in this film, and he got to choreograph his own two minute dance with Carol Haney. When I saw his name in the opening credits, I was trying to figure out which character he was playing, but when he started that dance, I knew it was him. It was fantastic. Ummm, yeah, this is a weird one - just because the whole justification for killing his wife is so weak, that when he later changes his mind, it just makes everything even more crazy, because the decision to murder a person was made so lightly. The story has an interesting twist though, which made it worth listening til the end. But I'm not sure how much I actually liked the ending. The Finishing School series is just good fun, and the third book carries on with that. Sophronia's adventures are a mixture of daring, luck, and cleverness and it's always a joy to read how she can get out of a situation. The actual plot of this book seemed a bit lighter than usual though. There is a mystery brewing and Sophornia manages to get mixed up in it all, but it seemed like a side issue, or something that would have a lot more bearing in the next book. I was surprised by how little actually happened in this one. But I was also surprised that Sophronia's feelings for Soap and Lord Felix is finally really dealt with. Things are definitely wrapping up! I'm glad that there is more of a definitive answer in this book on that point, because I am eager to get to the uncovering of the whole grand plot for the last book, and it would have been too much of a distraction for Sophronia to worry over her romantic attachments. Even though this book felt light on plot, there were plenty of entertaining scenarios and exchanges that kept me interested, as well as the mystery of the train. This book seemed like an important set-up to the last book in the series, and I am looking forward to finding out how Sophronia's adventures will conclude! The premise of this retelling of Jane Eyre does sound utterly out of place. Brontë's character is so righteous and a perfect role model, that to then turn Jane into a serial killer for a retelling sounds like the worst reading of Jane's character ever. However, this book manages to pull it off beautifully! 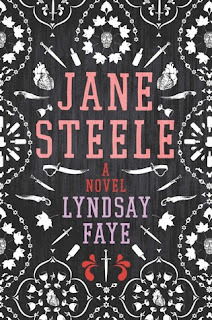 It helps that Jane Steele is seen as a parallel to Jane - that while we are reading this book, for some reason Jane Steele's life parallel's Jane Eyre, and Steele takes inspiration from Eyre's morality and steadfast honesty. However Steele is a different person, and in this extreme version of her story, Jane Steele feels the need and the satisfaction to make sure the horrible people in the book reap what they sow. That's another reason why this story works so well though. 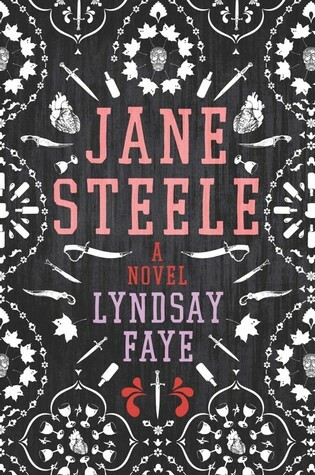 The characters are more Dickens-esque (even more so than that however) in their grotesque villainy, and it is still completely wrong, but just so satisfying that Jane Steele deals them the consequences of their actions. Jane does not kill people for no reason, and it's some horrible actions on the part of her victims that leads Jane to act. It was intriguing to read how certain characters - merely selfish and cruel in the original novel - become even more outrageously brutal and merciless in this version. It made me completely sympathetic to Jane Steele. A true highlight of this book though, is that even though it is a retelling, Jane Steele is completely her own character. The novel takes it's time to develop her story, her history and the characters that populate her world, without relying on prior knowledge of Jane Eyre. It's a complete story on it's own, and there are many memorable new characters in this book. Many of them are villainous, but one that very much appealed to me was Charles Thornfield's friend and confidant Sardar Singh - a capable, intelligent, Sikh commander, who just wants peace and contemplation. And who has a hilariously wry sense of humor. Charles Thornfield was this novel's take on Rochester and he was a very intriguing character. Secretive like the original, sardonic, curt, but a bit more virtuous perhaps to counter Jane Steele's past, and also wonderfully dry and humorous himself. His sarcastic comments that Jane always recognized as coming from a place of real affection made me smile, and love him all the more. It's sweet how touched Jane is by Charles's love for his friends and close family, and how that makes her want to be with him. Jane has had a very difficult life til this point and it's intriguing to see Charles Thornfield as her redemption, instead of the other way around as it is for Rochester and Jane Eyre. 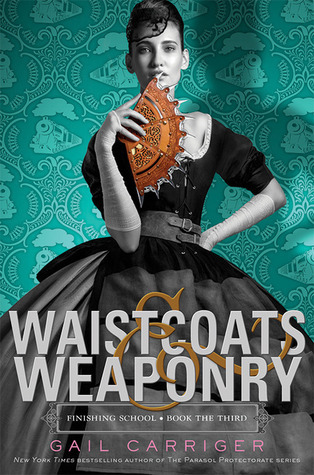 This novel is full of it's own twists and turns on the original, to make it a surprising and engaging read. I loved seeing all the nods to Jane Eyre, and the scenes that were repurposed or transformed to fit this narrative. And for the nods to other classics of literature like Nicholas Nickleby. This is a great mystery too, in addition to a coming of age story for Jane, and an examination of guilt and consequences for Jane as well as for Charles Thornfield. 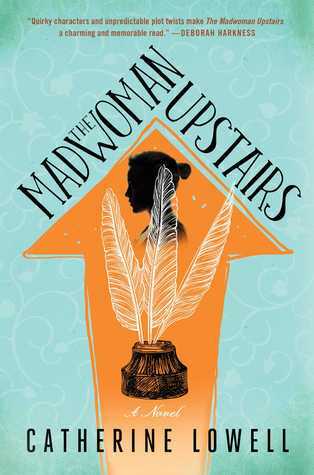 Even though I came to this book, expecting a re-visit on Brontë's novel, there is so much more depth to this novel, and I admired how brilliantly the author brought everything to life! Walter and Jack are twin brothers. Jack is the bad seed - he's grown up resentful of his brother Walter who was favored by his father and in the end inherited the bulk of the family money. Jack decides that maybe it's better if he takes over his brother's life and let's "Jack" die. He puts the evidence of his crime in a pasteboard box, intending to get rid of it, but that proves surprisingly difficult. The ways in which Jack or "Walter" tries by fails to get rid of that box was pretty inventive. And entertaining, especially when he thought he'd gotten rid of it, only for it to come back to him. Of course there is the all important irony of him needing that box in the end, and not being able to get to it. This story was very entertaining, despite how awful a person Jack is, but then, the irony that maybe his brother was not much better was fantastic! There were many things that sold me on this book. The comparison to the TV show Firefly. The promise from the synopsis of a space adventure. The sound of the main character who sounds scrappy and determined. The romance between two people who used to hate each other and the possibility of a great character arc. And the mystery of Planet X. So many awesome aspects to this novel, and I'm delighted to say that everything came together beautifully. The story immediately pulled me in, as the reader finds out about Solara and why she is so desperate to get a ride to the outer realm. And then Doran comes in with his ego, and his prejudices, and it was so satisfying to see him become a better person throughout this story. The characters in this book are wonderful. The crew of the Banshee, the ship Solara and Doran end up on, are a huge part of why this book was so entertaining. The reader sees what Solara and Doran see, so it's interesting to get to know these characters gradually, and while you see that they are a close knit group, it takes time and plot development to understand why. And then you feel a part of their group too. I especially loved Renny who has a bit of a character flaw, but is still a warm-hearted, good person. There's more to his character to explore in later books. Cassia and Kane have a unique relationship and a mystery about them too which was fun to explore. There are some dangerous space pirates and a scary group of hunters to add to the mix of interesting characters as well as adding to the suspense! The story is action-packed too - delivering on the adventure, as well as twists and surprises. I loved how immersive the story is too - it was easy to imagine the futuristic world and the new technology. And the story always felt grounded with the characters and drama. I felt this was a solidly written, entertaining jaunt, and I was invested in the characters throughout. The romance, always a draw for me, is developed beautifully - Doran and Solara seem very unlikely to come to any sort of understanding with each other at the beginning, but with the gradual breaking down of their walls, and the circumstances they found themselves in - the romance was believable and heart-warming. They are both complex characters with private tragedies, and it made sense that despite their antagonism, they came to understand each other better over time. The story was engaging from start to finish, with the ending especially nail-biting and dramatic. I think there is a lot more room for growth to discover more about the other crew members on the Bansheee, as well as more possibilities for fun and adventure, so I can't wait until the next book comes out! I will be sharing a guest post on Susie's blog, as well as having some Bronte themed - okay, who am I kidding - mostly Jane Eyre themed posts on my blog during that week. 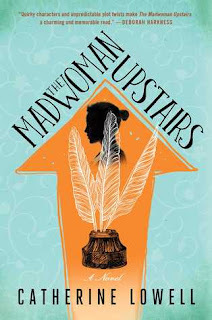 I haven't yet solidified everything I'll be posting but I will be writing a post about my favorite Jane Eyre adaptation, and featuring an interview with an author who's work is inspired by the Brontes! I'm very much looking forward to sharing these posts with everyone! If you are a Bronte fan, it would be lovely if you would join in on the fun! 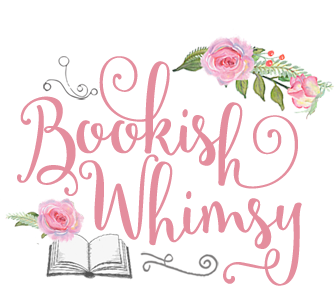 Discussion posts, book reviews, and anything related is welcome! 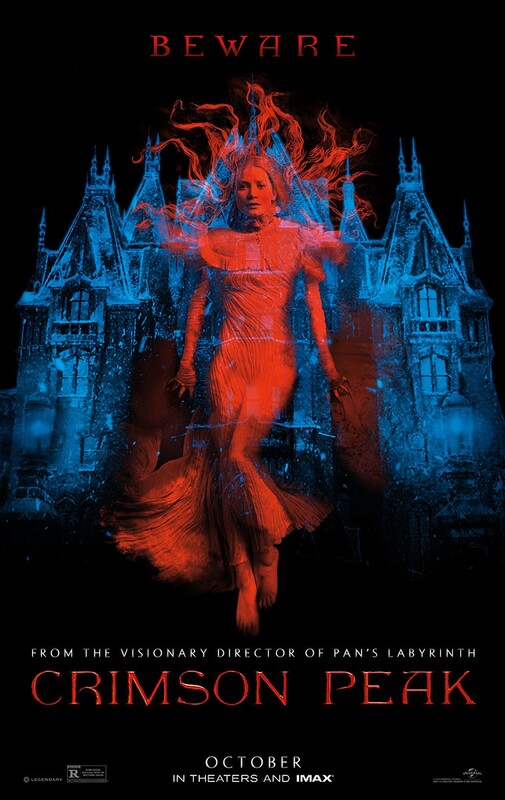 When I first heard about Crimson Peak I was so excited to watch it - a new take on the Gothic genre, starring Mia Wasikowska and Tom Hiddleston?? Perfection. But when I heard about Guillermo del Toro helming it, I was a little afraid. I think he has a truly remarkable talent and imagination, but after seeing Pan's Labyrinth, I wasn't sure I could take the graphic visuals. So I had to wait until I could watch it at home, with the comfort of many layers of blankets. And actually it wasn't as bad as I thought it would be! I had read that del Toro took inspiration from many Gothic novels including Jane Eyre, so that really piqued my interest of course, and it was delightful that an important dialogue was used from Jane Eyre for the proposal scene. The blooming romance between Edith Cushing and Sir Thomas Sharpe suited me perfectly in this film - it was of the kind that I will always swoon over. Especially with Sir Thomas - he prefers her to the other stuck-up society women, he sees and recognizes her talent as a writer, he's just generally charming and smooth ... and handsome. 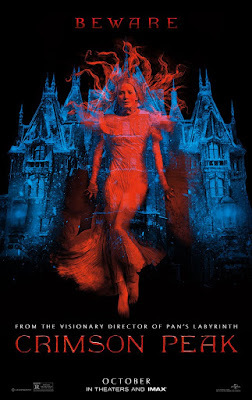 A good Gothic story blends romance with the aspects of horror and suspense and the romance in this film was very strong. I'm a little uncertain of my feelings for the horror aspect though. I liked that there is such a strong supernatural influence, which gives the film it's very eerie atmosphere and this film is just dripping with atmosphere. So much so, that the actual visuals almost seem a letdown which was odd for me. I would think I'd be happy to not be as creeped out at seeing what was actually lurking around the corner. But somehow, I felt like the ghosts just didn't creep me out. Perhaps it was knowing that they were not the real threat and they were just an indication that something was wrong about the house. But I do wonder if less would have been more, and if we had more of just hints of something lurking, I would have felt the horror aspect more keenly. The look of the film was simply gorgeous though. Very decadent and decayed and sinister with all that red clay that just seeped in everywhere. The story itself too is a typical Gothic melodrama - full of darkness and secrets. I will say that with Gothic novels I always feel that there is a bit of redemption factored in, and in this, I felt like it was a little lacking or maybe overshadowed by the events in the end. It left me feeling disconnected and sort of "Well, that's that then." I don't want to go too much into detail for fear of spoilers, but I suppose I felt a little unhappy with the resolution for some of the characters. Overall though, I think this is a gorgeous film - one that you should probably not watch alone, because it is disturbing in a subtle emotional way and you might want the comfort of humans nearby when you finish the film. Mrs. Helen Anderson tells the whole story to the police of how the dead man came to be in her house. It started when her husband - Harvey Anderson - got a phone call in the middle of the night from a man named Al. Helen wants to know who this Al is and Harvey reluctantly tells her he has a brother he never told her about. Because his brother is in an asylum for the criminally insane. But Al Anderson broke out and has been missing for years, until now. Harvey is going to meet up with him at the station and take care of everything. But Al comes in on an earlier train, and visits Helen at home. Such a strange and suspenseful story, but I feel like the title of the episode kind of gives away that all is not as it seems. I kept trying to figure out what the title could mean, so that kind of ruined the big twist in the end. But this was a very good episode, with lots of suspense, and the lead actress - Claire Trevor - made her character sound perfectly paranoid and nervous. As an epic fantasy, this novel is a wonderful start. The magic is intriguing, the world is expansive and volatile, and Vhalla is an empathetic protagonist. This novel is obviously the set-up to a great fantasy though, as it moves a bit slowly. All the seeds are there, but Vhalla is reluctant for most of the novel to embrace the world of sorcery. Fortunately, even though the pace is slow, the novel is saved by Vhalla's interactions with Prince Aldrik - he is such a beautifully enigmatic character! The magic is not entirely explained either. It's really unclear why Air is seen as such a special, feared magic in Solaris. And why it's so rare. The knowledge is teased though, and it makes sense that not everything is explained at first, since Vhalla is so reluctant to take on her training. Vhalla gradually works through her prejudice by learning from books and from the more informed people around her, which made me like her even more, because it was wonderful to see her grow as a person in that way - by becoming more informed and open-minded. The complicated relationship she has with Aldrik really made this novel for me though. I loved the slow-burn romance, and the way the characters came to appreciate each other's intelligence and personality in spite of their reservations about the other. It was a swoony romance that pushed me to keep turning pages, as I needed to know how it turned out. 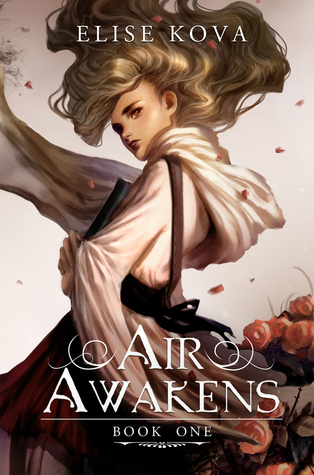 I've read that this novel has elements of Cinderella and Phantom of the Opera - both stories that I think worked beautifully in the context of this fantasy and in the way the characters interacted with each other. Even though Vhalla was indecisive for much of this book, the beginnings of a strong, determined and fierce heroine is there, and I'm eager to find out how powerful she will become in the course of this series. This is an excellent and immersive fantasy read! This is such a massive story, but there were a lot of dramas and character arcs the author had to wrap up. 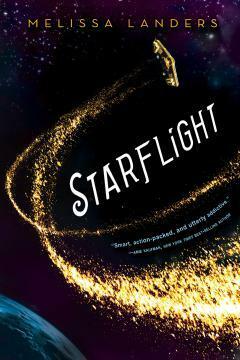 And overall, this was a beautifully told and completely satisfying conclusion to a fantastic science fiction series. Even though the story is called Winter, all the characters are equally important to the story. 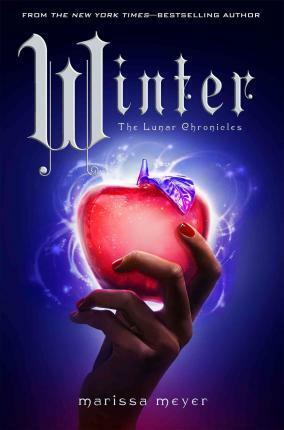 But because of the title, I'll start talking about Winter and her storyline. As always, I loved how Marissa Meyer integrated the Snow White fairy tale with Winter's story, and all the little references made me smile. Winter is unique in this series because she's so damaged and fragile, yet she has an inner strength that was beautiful to see. I'm not sure how I feel about her romance with Jacin though. It seems a little superficial, even though they have been through a lot. It's very sweet though, and Jacin is a wonderful character to get to know. His devotion to Winter is heart-warming, and he's smart and tough. Even if I wasn't completely sold on their connection, I liked them together - especially because Winter was so cute around him. Scarlet was a character, I kind of overlooked in the past - I really liked her, but I was more interested in Cinder and Cress, but in this book, I loved how Scarlet took charge and how strong and resilient and fiery she was in some very trying circumstances. She became a very admirable character in this book, and I'm happy that she came into her own more. Her romance with Wolf is another romance I'm a bit iffy on, but it's wonderful how much of a connection she has with him, and how devoted they are to each other. I couldn't help feeling all the love! Kai came out a much stronger and admirable character in this book as well. He has to make tough decisions and seeing his interactions with Levana showed how strong of a leader he was. It's too bad he was mostly powerless, but when he could act, it was very satisfying how quickly he made the right decisions. Cinder and Kai seem like a perfect pair, and I think of all the romances in this series and seeing how they developed, I love theirs the most. There is something so beautiful about how they look out for each other while also being true to their duties to their people. Cress and Thorne though take the award for most adorable. I just love them together and it was sweet, if prolonged, how unsure they were about each other's feelings. Thorne is always the most entertaining character too, so I thoroughly enjoyed their interactions. I have mostly talked about the romances of the characters in this story, but the plot is so important in this book. There's so much going on - so many threads that it was a struggle to read this book because I wanted to know what would happen immediately. Consequently I felt like the story dragged a little, and the pacing was sometimes slow, but I'm not sure if that was just because of my impatience. I think the author did a tremendous job of fleshing out every character and concluding their arc though, while also maintaining believably how difficult it would be for the characters to wrest control away from Levana. Levana was a true "nut-basket" too, and after reading the prequel novella about Levana's story it was fascinating to see and understand just how out of control she had become while Queen. Even though I had some sympathy with her after reading about her story in the novella, I was all about seeing her defeated in this book. The consequences of all the characters' actions felt real, and the characters had fitting endings which made this a satisfying read. 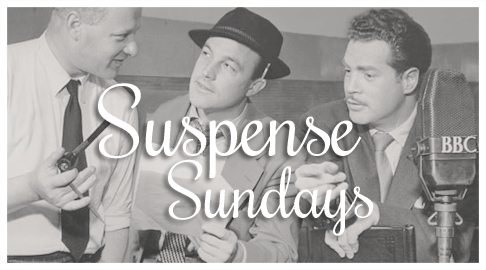 It had a lot of drama and suspense as well, which kept me engaged, and very impatient to get to the end. I'm sorry that the Lunar Chronicles series is over, but I'm happy for how it ended. Mentalist related suspense = me interested. I love that this episode has a double twist of a sort - as I wasn't sure which outcome was the real one. The story is told through Alma's diary as well, so there is the added benefit to the storytelling of not knowing how reliable a narrator Alma is. She's obviously mentally confused. The ending was a little less satisfactory to me - in terms of the justice of it, but overall I really enjoyed listening to this one. Being a Brontë fan, and more specifically a Jane Eyre fan, I appreciated how deeply rooted this story is in the Brontë oeuvre. There are so many overt and subtle references to the Brontës' work - with quotes, with the story's structure, and the characterizations. It was intriguing to read how it all came together in this fast-pace story. It's also a brilliantly plotted work, with mystery, tragedy and a sort of sharp, abrasive kind of romance. In many ways this novel gave me a lot to think about. The main character, Samantha, is somewhat unlikable - prickly, brooding and prone to dislike everything which annoyed me sometimes, but I did sympathize with her. Except for her hostility towards the Brontës. Often it seemed over the top, and uncalled for - blame laid on what she thought she knew about the famous family. But as the novel develops, she comes to understand more about herself and see her memories in a different light. It's interesting how this novel plays on fiction vs. reality and blurs the lines between what is important and how real one is versus the other. The novel has the feel of an academic study made into a human experience. And for that, I personally found this novel hard to connect to, but I also admire it for the way it tells it's story. It was also intriguing to read how all of the characters in the novel were characterized. They all had flaws, all made mistakes, and all of them were unlikable in different ways. The stories I like to read have a redemptive quality about them, and that was lacking in this book. Not that it's a fault, because it suits the story, but it just puts a distance between me and this book on an emotional level. I want to stress that, because I know it's a personal preference and it might be appealing to other readers. I mentioned the romance earlier, but it is not a big feature of the story - it is a very slow-burn one, that is never really made obvious until the novel is almost over. Even though it's there on a very low level, it helps to lift an otherwise very speculative and conceptual story about what it means to have a legacy like the Brontës' have, and if their real lives matter in comparison to the immortality of their work. And really how that relates to all authors and to fiction in general. This was an extremely thought-provoking book and a fast-paced, engaging read despite my issues with some of the characters. If you are interested in the Brontës this might be a good read for you (however even the Brontës are not portrayed in the best light) but it's full of fascinating viewpoints regardless. In Movie Musical Challenge, I'm watching 20 films I picked as great films or films I wanted to watch. This post is about the 1956 film High Society starring Bing Crosby, Grace Kelly and Frank Sinatra. High Society is a cute movie. Louis Armstrong, bookends the film with his song and his engaging personality. I feel like I've always just known who Louis Armstrong was - I've never really seen him in anything (except maybe one scene in Hello Dolly which I'll be able to revisit with this challenge), so it was interesting to see him in this and see what a personality he was, and how unique was his voice! Even though this is a fun movie, I'm not sure if I really loved it though. It felt a little strange that Grace Kelly's character Samantha, seemed both so maligned and worshipped throughout the film. I guess she wanted perfection from her men, but when she makes a mistake, it's okay to throw away her standards. It felt like a lot of bad decisions were being made throughout this movie. And the four way love quadrangle was a little weird - I wasn't sure who we were supposed to root for in this! The story is farcical, and over the top and just a little judgmental, and I wasn't expecting any of it. The music didn't stand out for me much either. With such star power as Bing Crosby and Frank Sinatra, this film certainly had it's moments, but not as much as I would have though. But I think the best song in this film is True Love. I already loved this song and didn't know it was from this movie, so that was a treat for me. The scene it goes to is very sweet, and the song is so liltingly beautiful. I was pleasantly surprised to know that Grace Kelly does have a nice singing voice too. 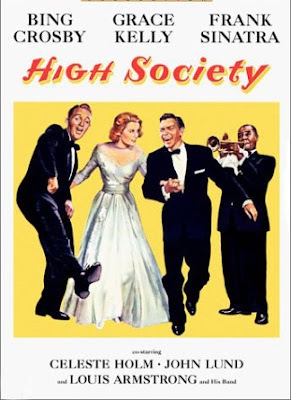 High Society had it's ups and downs for me - on the one hand, the plot is a little convoluted and unsatisfactory to me, and on the other I liked all the actors, some of the songs, and the characterizations were fun. There were some great comic moments as well.